Today I have another charming children’s book to present, on this occasion one that was written and illustrated by two promising young siblings. A real find. She wrote seven stories in the next couple hours. To my amazement, the stories were very cute. Three years later, after I published my own book, my daughter wanted to know why I couldn’t publish some of hers (she’s written lots more, since.) I thought, why not? I started to look around for an illustrator/cover designer. My son, Sunaad, wanted a shot at the art. So I downloaded paint.net, found a couple youtube ‘how-to’ videos for him, and he ended being our official illustrator. 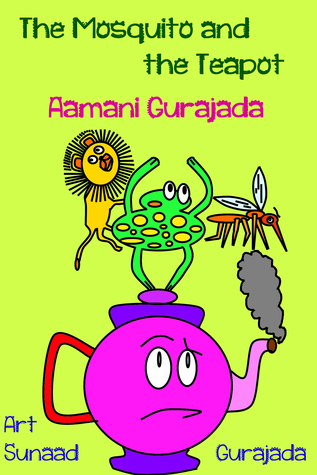 “The Mosquito and the Teapot” by Aamani Gurajada is an astonishing short book written and illustrated by two very young and very talented artists. The stories are short pieces in which usually two or three people, animals or things meet and resolve the conflicts between them. The simplicity of their form is disarming and there is a potentially very wise head behind the writing. The author seems to long for peace and resolve, which makes this a positive, upbeat and happy read. Like the lion and the tiger, sometimes people need to see the difference of their point of views, and sometimes we just need to stop doing silly or not-nice things. I really enjoyed this little gem. The illustrations however are not second to the writing but a clear equal. I was amazed at their beauty and professionalism, not at all what I had expected from a young illustrator. They are simple, full of character and masterly executed. I think both parents and children will enjoy this book and I hope it does well and reaches a large audience.